Enjoy life more by fast tracking your fly fishing journey with Warburton Fly Fishing. One lesson could save years off trying to do it on your own! Some things are taught and some things are caught and you can't learn everything on YouTube! Fly fishing is no exception. In one lesson you will learn things that would take months or years to learn and it could be your fast track to greater mindfulness, happiness, relaxation and well being for the rest of your life. Learning to fly fish is a small investment that doesn't need to break the bank. Bring another one or two friends and the cost per person gets much cheaper! Click here to visit our FAQ's page to find out about our reasonable rates. All participants will receive a summary sheet not just to stay on track but also to have references to resources to increase their learning and enjoyment. 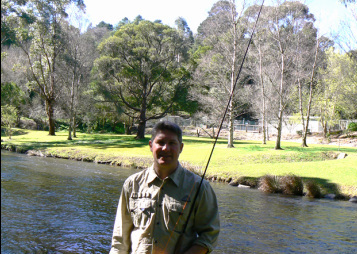 To book your fly fishing lesson contact David Szabo today. Hi, I'm David Szabo and I would love to teach you the basic principles of fly fishing for a lifetime of relaxation, adventure and enjoyment*.